Bob and Dotty Stuart have established a charitable gift annuity for the department of construction management, in honor of their daughter and their family's life long involvement with the program. 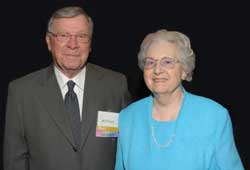 Bob and Dotty are both graduates of the LSU College of Commerce (as it was called in the 1940s). Bob Stuart is also the retired President and CEO of Buquet and LeBlanc, Inc., the oldest active commercial building contractor in the Baton Rouge area. Bob and Dotty's daughter, Sally Morgan, taught in the LSU department of construction management and now teaches at Texas A & M University. The Stuarts say they're proud of their lifelong relationship with LSU, both professionally and personally. Bob Stuart and LSU Foundation Board Member Bill Firesheets also worked together in establishing a professorship in the department of construction management 15 years ago. The Stuarts say the students from the construction management program are worthy of supporting, due to the consistent demand for their employment in the construction industry. They would like to encourage other graduates to consider leaving a legacy for future generations of Tigers in construction management.